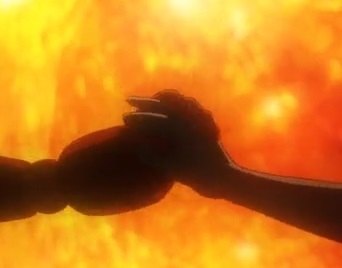 Oh huzzah, it’s another one-off episode of Space Battleship Yamato 2199. Fortunately, this self-contained story aims to be a little more high-concept than what the series has previously offered. 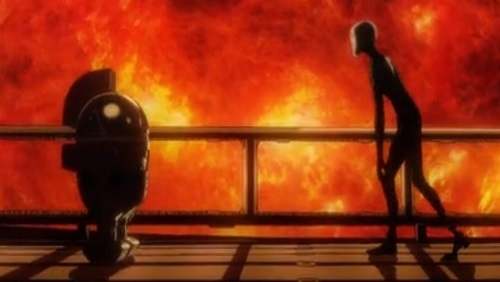 The plot alternates between two stories: one is an I, Robot meta-parable; the latter informs the former as Sanada and Analyzer interrogate a captured Gamilan android. Analyzing the Gamilan robot makes for both an interesting episode and something of a new direction for the series. Where the source material played it fast and loose in terms of actual science, Sanada’s interrogation is framed around using universal concepts to find a common point of understanding between Earth and Gamilas. During a briefing for the Yamato’s senior staff, Sanada reveals that the Gamilans share foundational models of mathematics and physics to those known by man. He then speculates that it should be possible to use mathematics as a linguistic root between the two civilizations. It might only be lip service to science, but it’s an improvement over the original. Anybody else remember that time Kodai and Yuki were hanging out on Pluto with little more than their uniforms and open faced helmets to protect them? Sanada, having wiped the captured android’s memory, assigns Analyzer to the task of creating a dialogue with the enemy machine. In another nod to science – and as Japan’s answer to Enemy Mine – Analyzer is unable to simply dump encyclopedic knowledge into the robot’s mind. He’s teaches the machine to understand human ideas and abstractions, just as a parent trains their toddler when they enter sentience. It’s around this time that the story ventures into a metaphysical realm that should be familiar to most genre fans. The Gamiloid, dubbed Alter by Analyzer, hacks into the ship’s network and discovers the Yamato’s “Goddess”. Having touched what he believes to be something neither machine nor biological, the Gamilroid breaks out of containment and begins searching the ship for the Goddess. Fans of the original series will remember that the Yamato had a “magic” navigation system that led the ship to Iscandar. The reveal of the “Goddess” in the sealed automatic navigation room takes a step back from that easy out of the 70s and into the realm of cybernetics, probably. Starsha of Iscandar originally dispatched one of her sisters to bring the wave motion core to Earth. 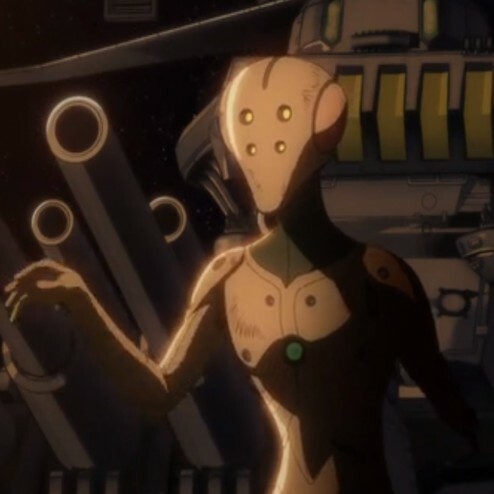 Perhaps Yamato 2199 will expand on that to the extent that the Icandari ambassador was also necessary as the Yamato’s biological core a la Karan S’Jet of Homeworld. I’ll put a pin in the discussion for now, if only because I’d like to know if I’m right before I commit to any detailed discussion. As Alter runs rampant throughout the Yamato, Sanada, Analyzer, and the security officers debate Freudian theories of self, up to and including the age old Star Trek argument that humans are just machines of a biological nature. It’s a bit cliché, but it injects a bit of humanity into Sanada, who to this point has been little more than the cold scientist doubling as an equally cold executive officer. Analyzer catches Alter when his legs snap on the deck of the Yamato. Please to note the symbolism. The final showdown between Analyzer and Alter goes so far as to work with the “horrors of war” trope in that we see how these two individuals become friends despite being on the wrong side of a war. Again, it’s a bit of a cliché, but thankfully it’s not quite as heavy handed some of the series’ other subtexts. Also, if injecting some grey areas into the story requires walking down well worn paths of science fiction then I’ll give the episode a pass. Ultimately both of the episode’s stories share the themes of likeness between divergent entities. Analyzer and Alter may be mechanical representatives of their respective worlds, but they are removed from the ideology of the war. Similarly, the quest for identity and love between #9 and the robot girl asserts that life, regardless of type, shares desires along common lines. Add to this what we now know about the differences between blue and white Gamilans and I expect this mood of universality to become more important to the broader plot.